THE ABSENCE OR PRESENCE OF of the human figure in art has never been a question of happenstance. Abstraction was, and is, a matter of modernist plastic and intellectual principles. At crucial moments in this century the glorification of the human figure, a figure whose historic reality lacked nobility, purity and promise, seemed an act of naiveté; and abstraction was delivered to the 20th-century consciousness as the only possible chance for art to fulfill its most idealistic imperative—to offer universal vision. Still, whether the figure has been there or not it has always held a relative position and this position has offered symbolic meaning. 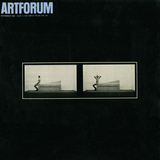 Order the PRINT EDITION of the November 1980 issue for $17 or the ONLINE EDITION for $5.99.